About 300 years ago estimates of 40 to 70 million American buffalo roamed the North American continent. 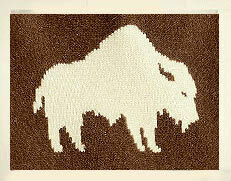 By 1880 records estimated only 1,000 buffalo remained. Thundering back from near extinction, there are now nearly 400,000 American buffalo grazing private and public lands. Indian legend says that a white female buffalo would be born bringing in a new age of peace, understanding, and prosperity. In 1994, a rare white female buffalo calf named Miracle was born on a small Wisconsin farm. The mystique of this calf made worldwide headlines, bringing more than 75,000 visitors from around the globe to see Miracle within her first two years of birth.